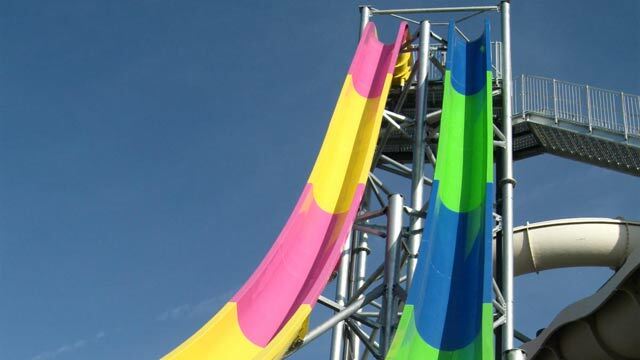 Adrenaline junkies, brace yourself for a 75-foot plunge coming this summer to the Cherry Valley, Ill., water park. A glimpse at the new Double Dare Drop, which plunges riders 75 feet. Magic Waters consistently places among the top five publicly owned water parks in the United States. For the past two years, it ranked No. 4 on the list compiled by Aquatics International magazine, which lauded the park’s high attendance, variety of attractions and very excellent safety record. But park director Jessica Steinberg knows that’s not why hundreds of thousands of visitors flock to the park every year. She ought to know. Proudly displayed in her office is a framed photo of herself – at 4 years old – posing with Wet Willy, a Magic Waters mascot now replaced by Tiki Tina, Shelbert the Sea Turtle and Ocho the Octopus. After graduating from Marquette University, Milwaukee, with a B.S. in International Affairs and Spanish, Steinberg was hired by the park district full-time in 2004. Today, she oversees not only Magic Waters, but also Sand Park, and the district’s other two pool parks, Alpine Pool and James Lesley Harkins III Aquatic Center. Steinberg was pleased with Magic Waters’ attendance of more than 211,000 people last year. The water park finished about $105,000 in the black, despite a shaky economy and cold, rainy spring weather. She attributes success to a solid master plan, an excellent staff and unbridled creativity. “We like to mix things up for the guests, by coming up with fun special events and exciting new attractions,” she says. A very exciting attraction debuted this June, when Magic Waters opened the Double Dare Drop speed slide complex, a set of tall, colorful parallel slides that plunge 75 feet. It’s a sure crowd pleaser for the thrill-seeking set. “It has a timing mechanism, so people race each other down the slides and see their scores,” Steinberg explains. Double Dare Drop shares a staircase with Tropical Twisters, a long, twisting body slide that starts five stories above the park, allowing guests to ride a thin layer of water to the bottom, reaching speeds up to 30 mph at some points. Like Double Dare Drop, the Splash Blaster water roller coaster, opened in 2000, also rates “5” on a 1-to-5 thrills scale. In this ride, a two-person raft rises 80 feet above ground, enters a dark tunnel, plunges 35 feet over the edge, then plunges another 30 feet to reach its surprising grand finale. But adrenaline junkies aren’t the only people Magic Waters works to please. “The park is unique in its design to serve ages infant to grown-up,” Steinberg explains. Little Lagoon is a safe place for tots age infant to 3 to frolic. As they grow, they can migrate to Tiki Island, which received a major overhaul last year. Among many bright-colored additions is a 1,000-gallon pineapple-shaped bucket, which tips and sends water splashing all around. There are also interactive water toys and four water slides. An area with lounge chairs and umbrellas allows parents to comfortably keep an eye on little ones. In 2010, 707,000-gallon Tsunami Bay, the state’s largest wave pool, was renovated to produce even larger waves, up to 6 feet high in some places, while offering tranquil areas of gentle waves, too. Along with installing Double Dare Drop this spring, contractors are busy renovating, buffing and polishing all of Tropical Twisters’ slides, which were built in 1984, when the park first opened under private ownership. The district acquired Magic Waters in 1988. Workers also are replacing the boardwalk that leads up to Tropical Twisters. Double Dare Drop and maintenance repairs are completely paid for by water park revenue, not tax money, notes Steinberg. Adding to the excitement at Magic Waters is a long list of special events, like SpongeBob, Pirate and Luau days, and a new favorite, Christmas in July. On July 25, the park is decked out with Christmas decorations, Santa Claus makes an appearance and guests elect a “best snowman” from among those submitted by staffers, part of a friendly inter-departmental competition. During Family Friday Fun Nights, guests arriving after 4 p.m. receive discounted tickets, and park hours are extended to 9 p.m. Radio Disney entertainers provide music and lead games, activities, giveaways and sing-alongs. “It’s a great way for families to kick off their weekends, grab supper here and enjoy the festive atmosphere,” says Steinberg. “Believe me, this is the place to be for a lot of families on Friday nights.” Dining options at Magic Waters include The Island Grill, Thirsty Turtle, Culver’s, Coconut Café and Snack Shack. For dessert, Dippin’ Dots sells treats that melt on the tongue. Last year, Magic Waters introduced a Fast Pass program that allows guests to go to the front of the line on the Splash Blaster. That program will extend to the Double Dare Drop this year. While fun is the goal for visitors, safety is always top of mind for Steinberg and crew. On any given day of operation, about 65 lifeguards are on duty. And they’re good at what they do. The 2011 lifeguard staff, comprised mainly of people ages 16 to 22, was awarded the Gold Award for Aquatic Achievement by Jeff Ellis & Associates Inc. (E&A), experts in international aquatics safety and risk management. Throughout the summer season, district lifeguards average about 300 water rescues at Magic Waters, and 100 rescues at the district’s other pools, according to park district records. Lifeguards aren’t the only stars at Magic Waters. The staff is often recognized by industry peers in the World Waterpark Association, for everything from effective employee recruitment and retention to clever marketing. Steinberg chairs the public water park committee for the organization, and has been recognized for her introduction of a detailed Polynesian theme, complete with unified color and font schemes, which has lifted the professional reputation of Magic Waters. In all, she’s responsible for 600 people during peak season at the district’s four aquatic sites, and seven year-round. Magic Waters is well positioned for success because of its surrounding population of 2.2 million within a 25-to-50-mile radius. This entry was posted on Wednesday, June 27th, 2012 at 11:59 am	and is filed under Recreation & Destinations. You can follow any responses to this entry through the RSS 2.0 feed. Both comments and pings are currently closed.